Aladeen: Ahh…America, built by the blacks and ruled by the Chinese. I am really looking forward to seeing Sacha Baron Cohen tackle more serious and dramatic work. I saw a hint of it in Hugo and, as is generally the case, comedic actors seem work just as well in a dramatic environment. I start out this way because I like Sacha Baron Cohen in general, but the movies that involve him trying being as offensive as possible do little for me. I chuckle at them, sometimes I laugh much harder, but when they finish, I am fine enough with what I saw and have no real desire to watch the film again. 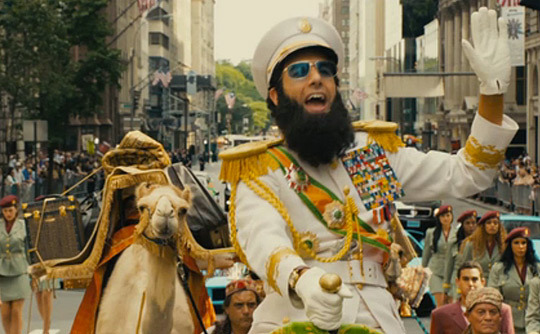 I have seen Borat once; I have seen Bruno once; and now I have seen The Dictator, but I do not really have any real lingering thoughts about any of these films that make me want to reflect on these crazy characters that Cohen has played (with vigorous and committed enthusiasm). Chances are people will generally enjoy this movie more than Bruno, but I am basically indifferent. 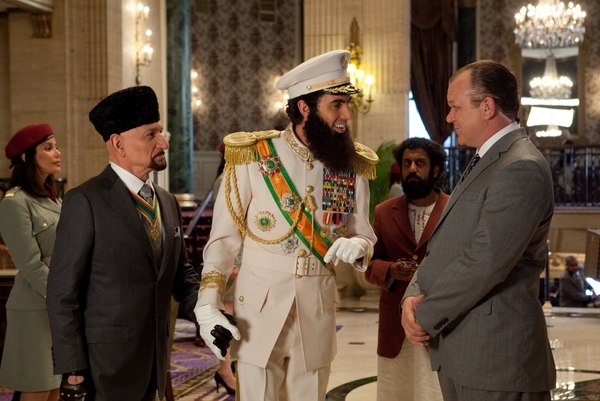 This time Cohen plays Admiral General Aladeen, the evil and oppressive dictator of the North African Republic of Wadiya. 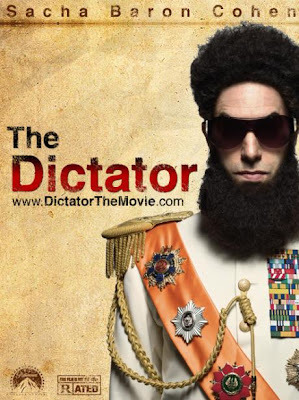 After some setup that establishes Aladeen as a cartoon version of many infamous dictators combined, the film’s story gets underway. 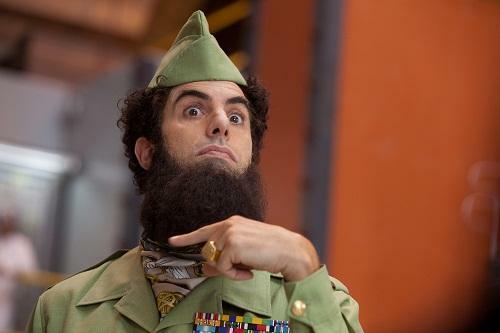 As it is revealed that Aladeen is developing nuclear weapons and is a terrible person in general, he is forced to travel to the UN Headquarters in New York to address the council. Upon arriving, Aladeen’s traitorous uncle, Tamir (Ben Kingsley), sets it up to have Aladeen assassinated and replaced by a double. Aladeen’s signature beard is shaved off, but he manages to escape; though finds himself trapped in New York with no recognizable identity. An activist, Zoey (Anna Faris), befriends Aladeen and offers him a job at her vegan-lesbian-immigrant-friendly co-op or something like that. Aladeen now has few options, but does manage to find aid from a man he thought he had executed in the past, Nadal (Jason Mantzoukas), and the two plan to find a way to get the true Aladeen back in the public eye, before Tamir and the decoy turn the nation of Wadiya into a democracy. Among other reasons, The Dictator falters for me by taking away the aspect that at least provided Cohen’s previous films with a credible level of shock-value entertainment. I am referring to the idea of having this be an actual film, as opposed to planting one of Cohen’s characters in the real world and getting real or “real” reactions. That element of Borat and Bruno made them a bit more enjoyable for me, mainly because I could not only enjoy the comedy at times, but also admire how brave Cohen would have had to have been in the process of taking his characters as far as they could possibly go. Stripping that away, what is left is how well Cohen and his collaborators could function based on how clever their screenplay for the film is, how effective the direction manages to be, and how willing the participants are in joining in on the “edgy” fun. Regarding the comedy and its purposefully offensive nature, I found it hit or miss. That said, the hits work well, while the misses are not so bad. When the film is good, it is very funny and those moments are usually within the very quick jokes that appear on screen for a few seconds, before moving on to something else. One of The Dictator’s best aspects is that it only clocks in at around 80 minutes. The less exciting jokes come from feeling like they are telegraphed and not all that clever. I would not really say The Dictator gets away with taking crazy turns as to how the humor is approached, which ultimately works in the film’s detriment. Given that it has a very standard plot (mistaken identity, supported by the obligatory romance aspect), the room to play around is there, but it will come down to how well one responds to the jokes. The idea of playing up the offensive angle on this film’s comedy does not really add too much to the proceedings. The Dictator comes of more like a modern age Marx Bros. film, with the added incentive to offend people, except it is not all that offensive. 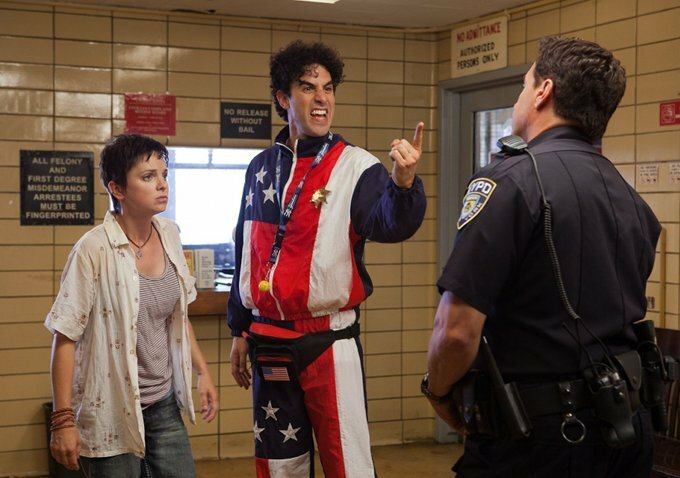 You would have to be incredibly sensitive and have no familiarity with Sacha Baron Cohen to really feel shocked by what goes on in this film, because the whole tone is way too playful to feel biting. There are some subtler moments here and there, as well as a couple bits that really do work at combining political satire with some smarter ways to be offensive, but the film is mainly just trying to have R-rated fun. Quite the big cast shows up for The Dictator, which ranges from a number of funny cameos (Megan Fox plays a convincing whore) to Ben Kingsley (slumming). The two key supporting parts come from Faris and Mantzoukas. Faris is fine with what she has to do, which is a mix of having confused reactions to her wacky Wadiyan friend and getting a few humorous moments of her own, given the extreme activist nature of her character. Mantzoukas is a lot of fun, namely because I like him in general, but also because his character is a Wadiyan who is able to provide an informed perspective in regards to Aladeen, as opposed to more and more characters that find him so “crazy”, and is thusly able to provide a fun sort of chemistry with him. I will be curious to see what the reaction is to this film. Despite being an R-rated comedy, mainly due to vulgarity, it is too light-hearted to be controversial. It also has too much structure and conventional elements to convey shock comedy effectively, in the same way that Borat achieved. I remain fairly in the middle on all of these, despite finding The Dictator to be the weakest of all these films, but it will be interesting to see how this film fares with those who really enjoy these types of Cohen’s film. Still, I will happily look forward to the upcoming choices that Cohen makes for his future starring projects. While The Dictator felt slight to me, Cohen is certainly capable and has an inspired comedic mind, especially if he can apply it well. Nadal: Don’t do anything to arouse any suspicion. Alaadeen: Don’t worry; I am Wadiya’s number one actor. You don’t win four Wadiyan Golden Globes for nothing. Nadal: Yes, you do, because you gave them to yourself.